Photon Shockwave is a set in the Yu-Gi-Oh! Official Card Game (OCG) and Yu-Gi-Oh! Trading Card Game (TCG). It is the sixth set of the OCG's 7th Series after. It is followed by Order of Chaos. The North American Sneak Peeks for this set took place from November 5–6, 2011. 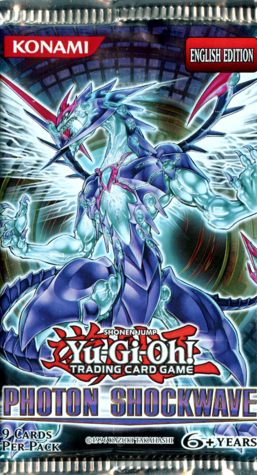 Photon Shockwave contains many cards from the Yu-Gi-Oh! ZEXAL anime, including cards used by Yuma Tsukumo, Reginald Kastle, Flip Turner, Nelson Andrews and Kite Tenjo. The TCG version of this set also includes cards used by Yusei Fudo, Kalin Kessler, Z-one and Axel Brodie. It introduces the "Photon" and "Evol" Archetypes to the OCG. It also includes further members and support for the "Wind-Up", "Number", "Watt", "Naturia", "Ice Barrier", "Ninja" and "Xyz" archetypes/series. It also supports Normal and Xyz Monsters, as well as LIGHT and WATER monsters. The TCG set also contains members and support for the "Dark World", "Vylon", "Laval", "Gem-Knight", "Gishki", "Junk" and "Infernity" archetypes. This pack features a common rabbit motif, in the form of 5 cards: "Bunilla", "Rabidragon", "Creepy Coney", "Rescue Rabbit" and "Wind-Up Rabbit". It is most likely based on the fact that this booster pack was released in 2011, the Year of the Rabbit. This page was last edited on 13 March 2019, at 14:50.